A Japanese researcher has brought the applications of spider silk to an entirely different register, using thousands upon thousands of strands of spider silk to create a set of violin strings. Most impressive of all, however, isn't that these strings are functional — it's that they actually sound incredible. Nara Medical University's Shigeyoshi Osaki (who has made a name for himself by mastering the art of coaxing silk from spiders) used over 300 captive female Nephila maculata spiders. Accordin to Osaki, these spiders generate the so-called "dragline silk" necessary to create bundles with a tensile strength sufficient for mounting on a violin. Each string was assembled from anywhere between 9,000 and 15,000 individual strands, twisted together in tightly wound trios of bundled silk. 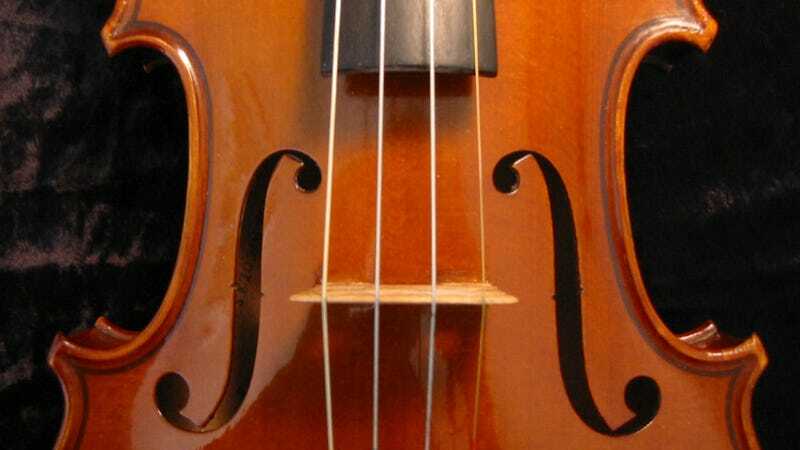 According to the BBC, each string was capable of withstanding even more tension than popular aluminum coated, nylon-core violin strings (although they were not as strong as traditional gut string). "Several professional violinists reported that spider strings... generated a preferable timbre, being able to create a new music," Osaki told the BBC. "The violin strings are a novel practical use for spider silk as a kind of high value-added product, and offer a distinctive type of timbre for both violin players and music lovers worldwide." The researchers' findings will be described in greater detail in a forthcoming issue of Physical Review Letters. Read more, and listen to the violin strings in action, over on the BBC.